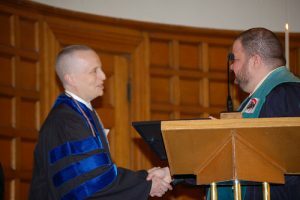 In May 2007, Leslie received an honorary doctorate from Starr King School, where ze delivered this speech at the school’s commencement ceremonies. This speech was also delivered, May 2007, at the Starr King School for the Ministry in Berkeley, CA. 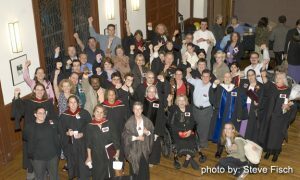 On Oct. 21, Leslie Feinberg, a managing editor of Workers World newspaper, was keynote speaker at the Annual Convocation of The Church for the Fellowship of All Peoples in San Francisco, where she was given the Howard Thurman Award “for hir activism and advocacy in defense of oppressed nationalities, women, disabled, the working class movement and the lesbian, gay, bisexual and transgender community.” Proclamations congratulating Feinberg were issued by the California State Legislature and the City and County of San Francisco. The mayor’s office named Oct. 21 “Leslie Feinberg Day.” Linked is the full text of her speech on finding common ground where communists and religious activists can be in solidarity in the struggle for social transformation and liberation.